Once an order is placed, it is submitted instantly to our warehouse for fulfilment, hence we will not be able to cancel or amend your order. You will receive a tracking email as soon as your order is shipped. This tracking service is provided by a third party app - Track My Shipment. Check your email folders and spams to look for this tracking email. You can also track your order at either Singapore Post or DHL eCommerce or at your local post website. If your order was shipped express, please track at DHL Express with your tracking number which you can find on your order or on your shipped confirmation emails. The final delivery is done by your country's local post (except for DHL Express). 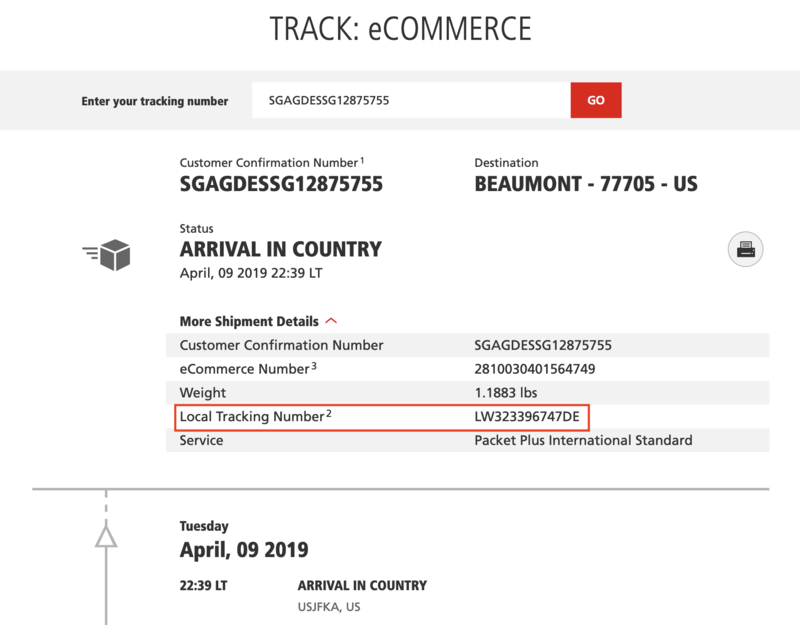 Once the package enters your country, you can get more detailed tracking on your local post website. You can use your Tracking No found on your tracking emails to continue tracking at your country's post office website. For DHL eCommerce, your tracking number will start from "SG", use this number on DHL eCommerce site and look under "Shipment Details", to get your local tracking number which starts from "LW". You can then use this local tracking number to track at your local post site, for example: USPS. If 4 weeks have passed since the shipped date and there is no further updates on your packages, please write to us. I did not receive an item which is missing from the order? We are very sorry if we had missed out items in your order. Please write to us within 7 days of receiving your order. When does my subscription boxes ship? All of our subscription boxes ship between the 3rd to 4th week of the month. Because we are shipping from Singapore, it is very common for you to receive the boxes in the next month if you are located overseas. You can cancel your subscription at anytime by logging into your subscription portal. By cancelling your subscription, you only cancel the auto renewal, all prior paid boxes will continue to ship. How can I change my address on my subscription? You can update your address at anytime by logging into your subscription portal. Please ensure that you update your address before the auto-renewal happens. If you were not able to do so, please contact us before the 15th of the month to ensure that your address get updated. How can I upgrade to Premium Box subscription? You can switch around your subscriptions at anytime before your next renewal. Just login to your subscription portal and under "Subscription", click "Edit". If you had already been charged for Regular Box, you can email us to assist you. How does the Starter Box subscription works? If you are a new subscriber, you are encouraged to subscribe to your monthly box through the "Starter Box" option. This will allow you to get your first box as our Starter Box. Our Starter Box is an one time trial box which you can decide to subscribe to our regular Elves Box or Premium Elves Box after you had received the box. We processes all orders in USD as our default currency. While the content of your cart is currently displayed in your selected currency, you will check out using USD at the most current exchange rate. Typically, it takes about 1-4 weeks from shipping date for international orders. While during festive seasons, weather delays or unforeseen circumstances, it can take up to 5 weeks. For Singapore orders, it typically takes about 2-3 working days from shipped date. My items got damaged during the transit, what should I do? We will assess the damaged item and will provide compensation with sole discretion. If your order is over $200 USD, your shipping gets automatically upgraded to DHL express. Do I have to pay custom taxes when receiving my orders? Please be aware that tariffs and taxes are not implemented by our company, but by federal government policies that are beyond our control. Our international shipping charges do not include any applicable import taxes, customs duties, or fees that are due upon entry into the destination country. All duties, fees, and taxes are the responsibility of the recipient, and are levied once a shipment reaches the recipient’s country. Customs policies vary widely from country to country and can cause delays beyond our original delivery estimates. Please contact your local customs office for more information. Occasionally, there will be popular items which will be on pre-order status. These are the products which you can place in advance to guarantee your order slot. Typically, these items will take about 2 weeks to be ready for shipment to customer. What happened if I included pre-order item(s) into my order? If your order consists of pre-order item(s) with other in-stocked items, your whole order will only shipped once the pre-ordered item(s) are ready for shipping. Hence, if you are in a hurry, place your pre-ordered items separately. Do you have a physical shop for me to visit and make purchases? Unfortunately, we do not have a retail shop. Hence all orders have to be made online. What other information should I know before making a purchase? Please have a read at our T&C!